This year, we are honoured to host world-wide leading voices in poetry and to share the landscape with impressive and mind-blowing talent across Uganda. 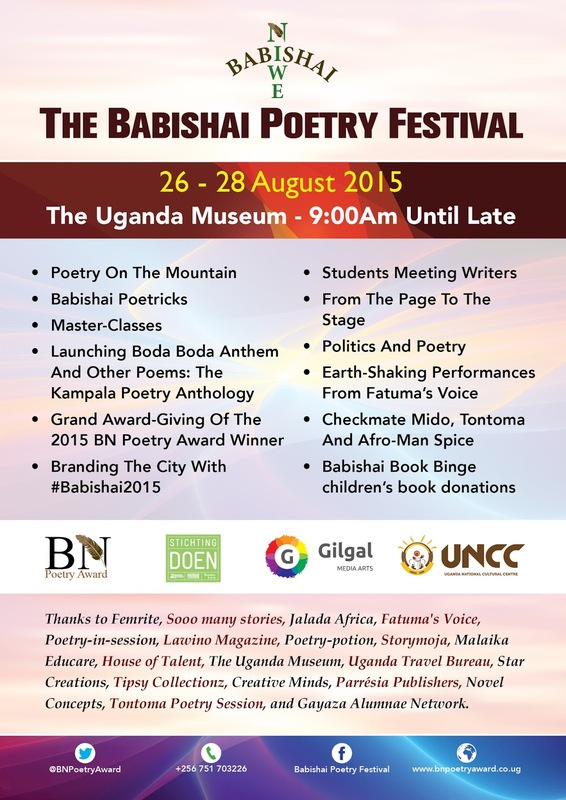 Babishai Poetry Festival, organized by the Babishai Niwe Poetry Foundation that coordinates the annual BN Poetry Award, is here, bigger and bolder. From August 26-28, at The Uganda Museum, Kampala’s not-to-miss poetry series of activity, shall bring together literary enthusiasts, budding and published, novice and established poets and lovers of the greater art of literature, from all over the world, to the Uganda Museum in Kampala, for a cocktail of stimulating events. Poetry in Session, a signature poetry platform in Kampala will also feature at the festival on day one alongside book signing at Dancing Cup, Bugolobi, a suburb that gives a tranquil romantic touch to a high energy session hosted by Roshan Karmali. There will be performances by the outstanding and celebrated, Kenya’s Fatuma’s Voice.